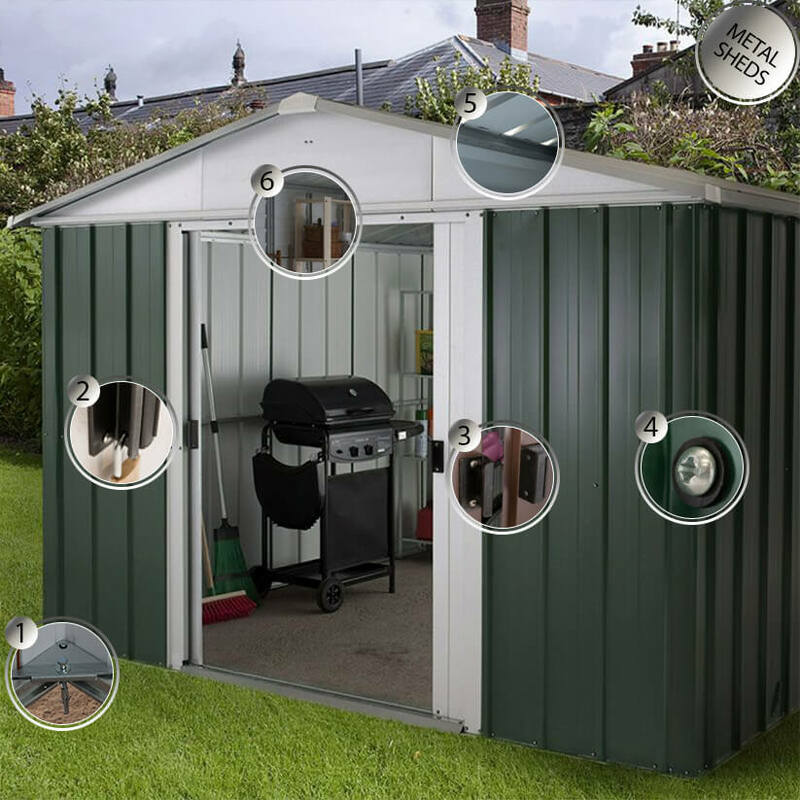 Cleverly designed, built from premium materials and with a fantastic 15-year anti-rust guarantee, this green metal shed is the ideal place to safely store garden equipment, outdoor furniture and bicycles. Cleverly designed, built from premium materials and with a fantastic 15-year anti-rust guarantee, the 10' x 8' Yardmaster Green Metal Shed is the ideal place to safely store garden equipment, outdoor furniture and bicycles. Completely constructed from hot-dipped galvanised steel, with a smart apex roof and a stunning baked-on emerald-green finish, this premium metal shed is not only built to last but is incredibly handsome too. Weather-resistant, blister, crack and insect-proof, with no worries about painting, treatment or wind-torn roof felt, this maintenance-free garden shed offers outstanding protection for stored items with zero hassle. Furthermore, the unique 7 layers of protection ensure that corrosion will never be an issue and that it will remain looking pristine for many years to come. Easy access to this metal shed is gained through sliding double doors, which are overlapping, padlockable (padlock not included) and fitted with anti-tamper bolts, so stored items will be completely protected from the elements and unwanted attention alike. High gables and ventilation along the ridge and eaves make for plenty of headroom and ideal storage conditions respectively. Measuring 2020mm x 3030mm x 2370mm, this 10x8 garden shed comes with rust-proof screws, anchor fixings, clearly-numbered parts, an assembly manual and UK-based telephone support to ensure a straightforward, secure assembly. We are proud to stock the Yardmaster brand of sheds. As Europe’s #1 metal shed manufacturer, quality construction and customer satisfaction are their top priority. Their sheds are 25% stronger than other European sheds. Plus, Yardmaster’s proven 7-layers of protection (including a primer coat, finish coat, 2 oxide layers and a wash reverse coat) make these hot dipped galvanised steel sheds completely maintenance free. Please note: only the Shiplap, Woodview, Emerald Deluxe and Castleton ranges feature a 15 year guarantee. All other Yardmaster models boast a 10 year guarantee. The images below showcase all the superb benefits of our Yardmaster sheds. As Europe's leading metal shed manufacturer, Yardmaster produce sheds and other outdoor buildings of the highest calibre. Renowned for their high quality build and their maintenance free finish, Yardmaster sheds are able to boast impressive guarantees. The range of practical features shows an attention to detail and a clear understanding of their customers' needs. Plus, Yardmaster sheds come in a range of styles and colours to suit all gardens. An anchor kit is included for fixing the shed to your base or paved area. Internally mounted, overlapping double sliding doors to keep out rain. Ventilation along roof ridge and eaves to combat condensation. 150mm wide ridge cover allows airflow but prevents rain penetration. Generous headroom. High gables on all apex models with up to 2.2m headroom and up to 1.8m eaves. Forget painting or rustproofing – these metal sheds are maintenance free. A superior baked on finish keeps them looking great for years. The weather or pests are no match for their quality build. With Yardmaster’s clearly illustrated manual and the help of a friend, you can assemble your metal shed in approximately 3-6 hours. Yardmaster also provide local helplines to provide any extra assistance you may require.